Welcome to the Official RRL TRADING THREAD! 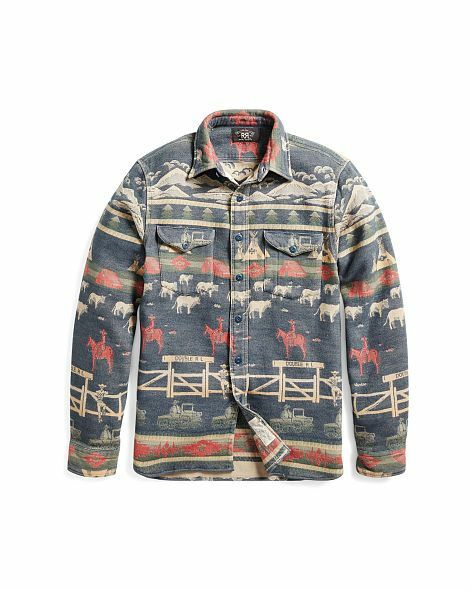 This is a thread for RRL enthusiasts to post their new or pre-owned RRL items for sale or trade and for those looking for specific RRL items to post their “wanted” requests. Linen/Cotton blend, Slim fit indigo checked workshirt from SS 2016. While very light and breathable, it's not an overly thin shirt, making for a great year round material. Almost feels like flannel but it's much more breathable. Worn 1-2 times, perfect, like-new condition. Awesome job, Patrick! Thanks for creating this thread. Awesome. Appreciate you starting this thread! Thanks for starting. Good stuff. Brand new with tags. Olive Japanese selvedge left-hand twill. Size 31x34. This is from a few seasons ago. Very hard to find the style in this colorway in selvedge today. A favorite among RRL styles, this classic chino style is made with a rigid selvedge cotton twill fabric and features a medium rise, button fly and a slim straight fit through the leg. Mid-rise with button fly and single button closure. Two on-seam front pockets with embroidered point details. Welted coin pocket at the right waistband. Exploded seam at back for comfort. Great! Thanks for starting this thread. And just like that, BOOM. From inspiration to execution... good job Patrick B. If I was just getting into RRL, this is the spot I'd wanna be. I am interested in purchasing the following shirts in a size small. New with tags would be preferred, but I am not opposed to lightly used shirts as well. The parka and vest are seriously tempting.